I’ve already told you that no distance is too far for the parents to travel. Lunch in Edinburgh? Not a problem. Meet you at a historic castle just north of the Outer Hebrides? See you there in eight hours. And their go-anywhere attitude proves a blessing when there are any DIY jobs to do in Leeds (the husband having been rendered incapable of doing any odd jobs after a frightening incident involving a circular drill, details of which even he doesn’t want to share). The only problem with my father and his handyman skills is that each task requires two long-winded journeys to Yorkshire: the first to Weigh The Job Up and the second to actually complete said job. Why my father has to travel 60 miles to Leeds and 60 miles back, to Weigh Up A Job that I have described in detail on the phone, I have no idea. I think he just likes a day out. The parents’ latest DIY trip to Leeds, involved them dutifully trundling over the Pennines to complete some jobs at my rental flat (of Greenclaws fame). I had compiled a list of simple tasks, such as putting up a curtain rail, mending a table, and some grouting in the bathroom etc. On arrival, my father spent some time peering thoughtfully at the list. He stroked his chin and ambled around the flat at a leisurely pace, occasionally getting his tape measure out, and prodding at the walls with his damp meter (he loves his damp meter). And then he announced that, although he had brought his toolkit, he hadn’t got quite the right tools for the job – but not to worry as this was more of a ‘recce’ visit and he would earmark a day next week to return and actually get on with the jobs. More importantly, he wanted to know where we were going for lunch. 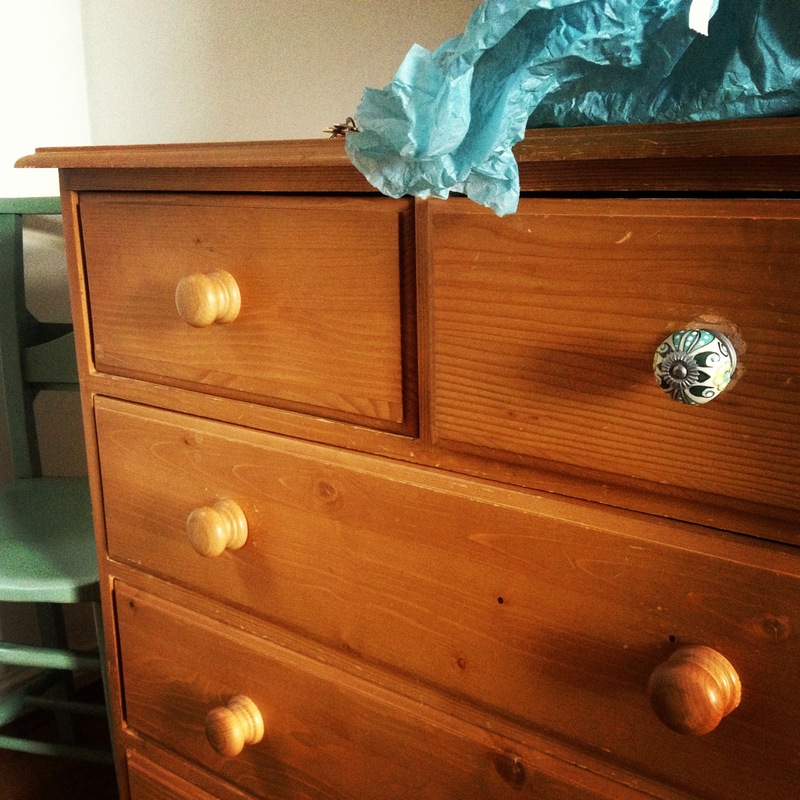 Also on the list, was the job of putting some vintage knobs onto an old chest of drawers (a task that should have been simple but left me with a broken screwdriver and several blisters) so I stacked them into the back of the parents’ car and sent them back to Preston, thinking that at least that was one job he could be getting on with in the meantime. Several days later, I phoned my father for a knob update. There was a maddeningly long pause. ‘Not, the Nobbs…’ I cried, a trifle wildly. ‘The drawer knobs’. It transpired that my father hadn’t done the knobs. But it was okay because he had Weighed The Job Up and concluded that it would take him all of five minutes. I resisted the urge to ask why he hadn’t just got on and Done The Job at the same time as weighing it up, if it really was that simple. A week later, I was back in Lancashire at my sister’s birthday barbecue. My father was enjoying a beer in the sun. The parents had offered to take me back to Leeds early the next morning to complete the ever-growing DIY job list, along with my newly-knobbed drawers. ‘Have you done the knobs?’ I hissed. ‘Not quite,’ replied my father, closing his eyes and beaming into the sun. He seemed remarkably relaxed for a man who had less than 18 hours to complete this complex carpentry. The next morning the parents rolled up at my in-laws, drawers smugly stacked up in the boot of the car. My father smiled out of the car window. ‘Now, your Dad was thinking that he might need to weigh up this curtain pole first…’ said my mother.